"WOW! I just don't know what to say about these wonderful awards. The Hall of Fame was a real shock. I'm so very thrilled that Kathy is part of it as she really is the guiding light for me. "Without her love and support I would probably be living in a cave somewhere. Thank you again for creating this fantastic award so we can share our passion for the genre. "I feel like the luckiest Monster Kid in the world." into Monster Kid Hall of Fame with wife, Kathy. "As a long time lurker on the classic horror board, and a long time fan of Rondo himself, I am pleased to hear that The Twilight Zone's 'It's Still a Good Life,' is being honored with the big head. "One of the reasons I took the job was to write and produce that episode. Getting it made was no easy thing, and getting it made right was even tougher. So the thought that people dug it is no small thing. Very cool, indeed. "I will proudly display the big head on a shelf in my library, right next to my signed postcard of Don Megowan. Thanks, both for the award, and the kind words." -- Ira Steven Behr, executive producer and writer of Twilight Zone episode, 'It's Still a Good Life,' named Best TV Presentation of 2003. "I'm totally wowed. So often you write things, and outside of the few friends you're in contact with, you don't hear much in response. So for some people out there to like what I'm doing is really heartwarming. "After all, my heroes have been for many years now (not to make anyone feel old), Greg Mank, Tom Weaver, Michael H. Price, and one or two others. To even come up in the same breath as these folks -- again, I'm wowed. "The Rondo itself is beautiful and is proudly sitting on my table in my home office. It really is stellar in appearance, and so I applaud (as I so regularly do for different reasons) Kerry Gammill." -- Gary Don Rhodes, winner Best Article of 2003 for "The Horror Crisis of 1932" in Monsters from the Vault. "Donna and I are delighted to be able to tell our '2002 Best Magazine Rondo' that his little brother is on the way! "This was a year of big changes for Video Watchdog -- the introduction of color, modifications to a 14 year-old cover format, tweakings of our interior format, and our first price hike in eight years -- so this year's award is quite meaningful to us, and distinct from last year's. "We accept it on behalf of all the talented writers and artists who work so hard, every month, to make VW what it is -- and promise that our 'Best Issue Ever' is yet to come." -- Tim and Donna Lucas, Best Magazine of 2003, Video Watchdog. "You've done a terrific job, once more. Thank you, again." -- Marty Baumann, The Astounding B-Monster, named Best Website of 2003. 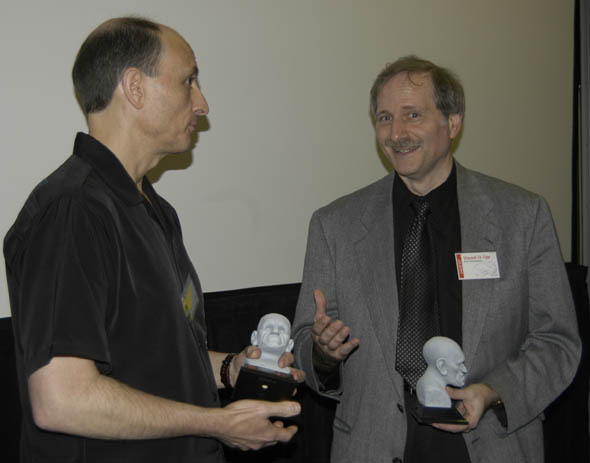 Winners: Marty Baumann, left, and Vincent Di Fate at WonderFest Rondo ceremony. Photo: Eileen Colton for CHFB News. "I can't tell you how thrilled I am by the Rondo win and how much the award means to me. It would have been honor enough to have simply been nominated. Winning, of course, is better, but the nomination by itself acknowledged that some out there thought there was merit in what I had done. Some of us, even after decades of toiling in the field, need such validation, and for this I'm deeply grateful. "I have won many awards over the years, but this one is my favorite." -- Vincent DiFate, Best Cover of 2003 for Creature art on Monster-Mania Convention Program. "I am honored to have received the 'Monster Kid of the Year' Award. Thank you very much. I was honored to find myself in the company of Forry and Bob and Kathy Burns. "Getting Ray Harryhausen his star (on the Hollywood Walk of Fame), was thrilling, as you can imagine. But to top it off with a bust of Rondo Hatton -- whose films I enjoyed on Chicago television's "Shock Theatre" in the 1950s -- is wonderful." -- Arnold Kunert, named 2003 Monster Kid of the Year for his efforts getting Ray Harryhausen a star on the Hollywood Walk of Fame. "I am somewhat shocked by winning, to be honest. I am honored. Thank you." -- Michael F. Blake, Best DVD Extra of 2003 for commentaries on The Lon Chaney Collection. "I was so pleased to see that 20,000 Leagues Under the Sea won for Best Classic DVD. During our two years on the project, we uncovered behind-the-scenes footage of the sunset squid and other materials prominently featured throughout the disc. "This project was a labor of love for me as I'm a major fan of the film. The restoration was by Scott MacQueen and he should definitely be acknowledged as well. "I must say I have great respect and empathy for Mr. Hatton. I am pleased to be aware of your efforts dedicated to his memory; please let me know if there's anything I can do to help in the future." -- Eric Young, CEO Sparkhill Productions for Best Classic DVD of 2003, 20,000 Leagues Under the Sea. "The Rondo statue is, quite simply, the epitome of cool." -- Bob Madison of DinoShip, publisher of Monster Kid Memories, named Best Book of 2003. Here's to the winners: David Colton, presenter of Rondo awards at WonderFest in Louisville, Ky. in May 2004, with winners Tom Weaver, Tim and Donna Lucas, Bob and Kathy Burns, Marty Baumann, Vincent Di Fate and make-up artist John Goodwin, accepting for Sideshow, winner of Best Model for 12-inch Creature. Photo by Eileen Colton for CHFB News.